Purchase 50 or more Emergency Eye Wash First Aid Stations and download your free support pack worth £100. 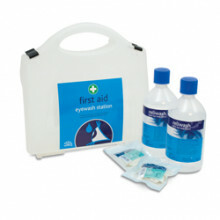 Purchase 200 or more Emergency Eye Wash First Aid Stations and you can have personalised covers absolutely free! A first aid kit for emergency situations where eyes have become contaminated and require emergency cleansing. Pack contents are encased in foam.